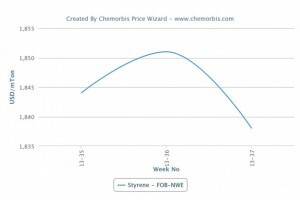 Spot styrene prices posted decreases in Europe this week, weighed down by slower downstream demand coming from the PS and EPS markets as well as the recent drops witnessed in the energy markets, as per the pricing service of ChemOrbis. 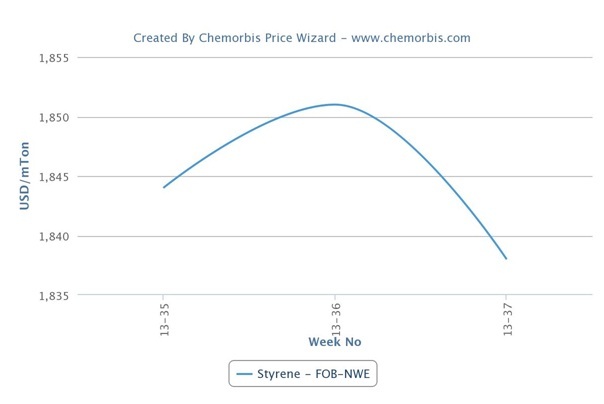 Spot styrene prices on an FOB NWE basis declined around $50/ton on the week. When compared to early September levels, spot prices are suggesting a larger drop of over $100/ton as record high PS prices hampered demand, causing some regional producers to reduce their operating rates in September. Styrolution lowered the operating rates at all of its PS plants across Europe this month due to subdued demand. The company operates a 475,000 tons/year PS plant in Antwerp, Belgium, 80,000 tons/year plant in Trelleborg, Sweden and a 180,000 tons/year PS plant in Wingles, France. In addition, several plant closures added to the softer demand for styrene this year. France’s Total Petrochemicals shut its 80,000 tons/year PS plant at Stalybridge, the UK at the end of March, citing weaker demand and a fast contraction in the European PS market. Prior to Total, Ineos Styrenics shuttered its 180,000 tons/year Marl PS plant in Germany in October 2012, causing a reduction of over 5% in PS operating rates towards this year. Besides reduced derivatives demand, the recent easing in the energy markets was cited as another reason behind softer styrene prices. Crude oil futures on the NYMEX declined 2.1% last week, posting the largest drop since the week ended July 26 as tensions over Syria are easing due to the US pursuing a plan to confiscate the nation’s chemical weapons. Brent crude also dropped as much as 2.7% to hit the lowest level since August 20 during intraday trading on September 16. According to ChemOrbis, spot naphtha prices on a CIF NWE basis also dropped around $30/ton compared to last week as the heavy cracker turnaround season in Europe dampened demand for naphtha. Ineos’ No 5 steam cracker in Cologne, Germany is reportedly in the shutdown phase for a turnaround. SABIC was also expected to shut its Olefins 4 cracker at Geleen, the Netherlands over the past weekend.